This article is an examination of the speed of the reimagined Enterprise as compared to the original version of the ship. For this purpose we shall focus primarily on the trip the ship takes to Vulcan. Trip : "And how am I supposed to take this?" Trip : "You're sorry. You brought me sixteen light years just to watch you get married to someone you barely know?" They had previously been on Earth, so this is a definitive canon statement of the distance between the two. Fans have long speculated that Vulcan orbits the star Epsilon Eridani. However, that star lies 10.5 light years from Earth, making it impossible that Vulcan is there. James Blish has also suggested that the star 40 Eridani may be Vulcan's home star. As 40 Eridani lies 16.5 light years from Earth it is an eminently suitable candidate, and the official (but non canon) Star Trek Maps book supports this star as the location of Vulcan. Kirk : "Shall we give the Enterprise a proper shakedown, Mister Scott?" Scotty : "I'd say it's time for that, sir. We can have you back on Vulcan in four days, Mr Spock." This establishes that the Enterprise can comfortably cruise to Vulcan in four days, a speed of about 1,460 x c. Whether this should be taken as the maximum speed of the ship is uncertain; a shakedown cruise may involve a test of the ship's highest speed, but can equally involve a period of taking things easy whilst you work out the kinks in the system and get the engines "run in". But four days to go from Earth to Vulcan is certainly a baseline figure that we can use for comparison. The Star Trek movie features a reimagined version of the Enterprise constructed in an alternate timeline. Some small controversy has surrounded the ship's trip to Vulcan, a trip which, on the surface, appears to take a few minutes. 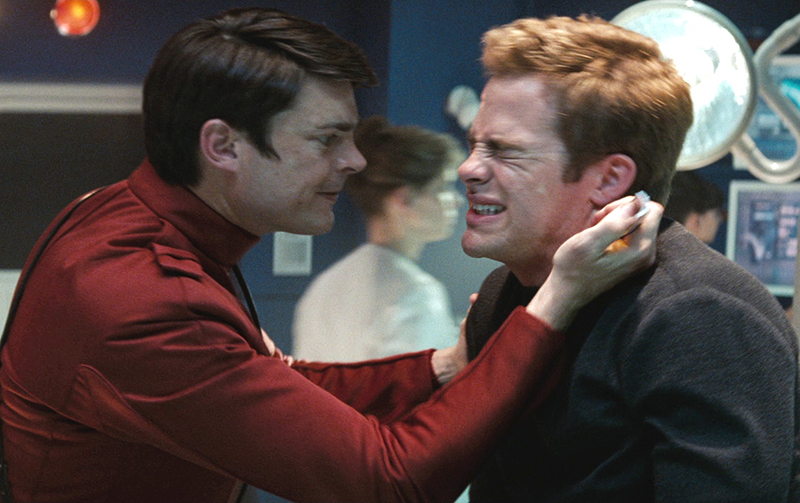 McCoy injects Kirk with a hypo to make him officially a patient of his. This gives him a pretext to bring Kirk, who is on Academic Suspension, aboard the Enterprise. The ship jumps to warp speed shortly after their arrival. We then see McCoy bring Kirk to the medical bay and inject him with a "mild sedative". Kirk then falls asleep. We cut to the bridge where Sulu announces that the ship is at maximum warp. The Captain asks Chekov to give a mission briefing to the crew, which he does. At the end of his briefing Chekov announces that they are three minutes away from Vulcan, at which point we cut to Kirk waking up in the medical bay. Since it was only a mild sedative, we can assume that Kirk was in a light doze that lasted no more than, say, an hour or so, right? And so it seems like the trip to Vulcan was extremely rapid. He also greets Kirk with "Oh, you're awake!" This could be taken to indicate that Kirk has been asleep for a long time. There are, on the face of it, a couple of issues with this. For one, the scene of Kirk waking immediately follows Sulu reporting to the Captain that the ship is at maximum warp. The implication seems to be that the Enterprise has only just achieved maximum warp after leaving Earth, and surely this is something that takes only a few minutes or so. However, this isn't necessarily the case. It may be that the Enterprise takes days to rev up to maximum speed; there's no inherent reason why a ship should be able to achieve top speed in minutes or seconds rather than days or even weeks. True, the ship stops instantly but so what? Perhaps warp drive works that way, where you have to push push push to get to high speed but then stop as soon as you turn the warp drive off. But even simpler than this, we could assume that the ship went to top speed rapidly, then slowed - perhaps some minor engine difficulty that we didn't see? And then this was overcome and the ship accelerated back to maximum speed just before reaching Vulcan. And simpler still, perhaps it's just normal practice to update the Captain on the status of the ship every now and again. It would make sense that the helmsman report to the Captain on the ship's speed every hour, or at the start of every watch, or whatever. This would handily explain away the issue, and we could assume that the reimagined Enterprise did indeed take several days to reach Vulcan. Only... no, we can't. That is impossible. To understand why, we need to look at the bigger picture. I'll lay out exactly what happens during this entire sequence, from the ship going to warp until the ship arrives at Vulcan. The below is not from any script or novel - it is transcribed directly from the DVD and is as word perfect as I can make it. There are occasions where characters talk in overlapping lines, and I have indicated this whilst listing the dialogue as best I can. Sulu : "Ready for warp, sir." Pike : "Let's punch it." Sulu pushes the throttle forward and the ship leaps to warp. Kirk : "This isn't worth it!" McCoy : "A little suffering is good for the soul." Kirk : "Hi, how are ya! " Kirk : "My mouth is itchy! Is that normal?" McCoy : "Well, those symptoms won't last long. I'm going to give you a mild sedative." Kirk : "Urrrrrgh, I wish I didn't know you!" McCoy : "Don't be such an infant!" Kirk : "Argh! How long is it supposed to..."
Sulu : "Engines at maximum warp, Captain!" Pike : "Russian whiz kid, what's your name? Chenko, Chirpov?" Chekov : "Ensign Chekov, Pavel Andreivich, sir!" Pike : "Fine, Chekov, Pavel Andreivich, begin shipwide mission broadcast." Chekov : "Yes sir, happy to." Chekov : "Ensign authorisation code, nine five wictor wictor two." Computer : "Authorisation not recognised." Chekov : "Ayy! Ensign authorisation code, nine... five... victor... victor... two!" Chekov : "May I have your attention please. At twenty two hundred hours, telemetry detected an anomaly in the neutral zone, what appeared to be a lightning storm in space. (cut to the briefing playing in a different part of the ship) Soon after, Starfleet received a distress signal from the Woolcan high command that their planet was experiencing seismic activity. Our mission is to asses the condition of Woolcan and assist in evacuations if necessary. We should be arriving at Woolcan within three minutes." McCoy : "Ah, Jim, you're awake! How do you feel?" McCoy looks down. His eyes widen. McCoy : "Good god, man!" Kirk : "What the hell is this?!" McCoy : "A reaction to the vaccine, dammit! Where's Chapel? I need fifty cc's of cortizone!" Chekov : "What appeared to be a lightning storm in space." Kirk : "We gotta stop the ship!" McCoy : "Jim! I'm not kidding, we need to keep your heart rate down!" Kirk : "Computer locate crewmember Uhura!" McCoy : "I haven't seen a reaction this severe since med school!" Kirk : "We're flying into a trap!" McCoy : "Dammit Jim, stand still!" Kirk : "Argh! STOP IT!" Uhura : "Kirk! What are you doing here?!" Kirk : "The transmission from the Klingon prison planet! 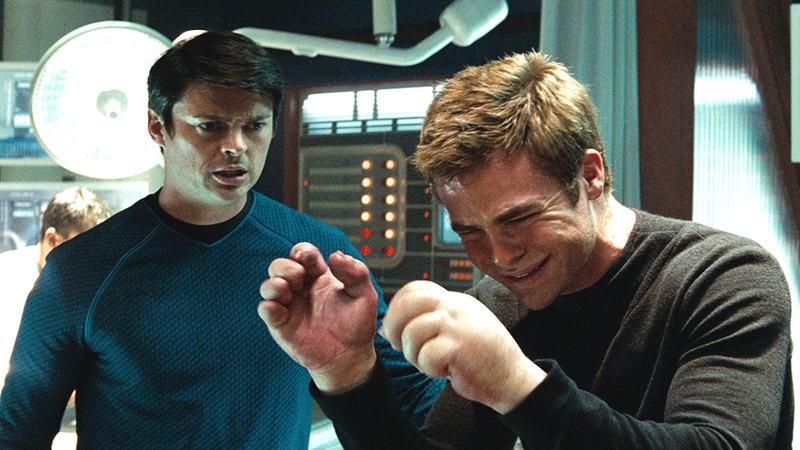 What exactly did it-"
Uhura : "Oh my god, what's wrong with your hands!" Kirk : "Look, who is responsible for the Klingon attack? Was thwe sthwe Thomlram?" Uhura : "Was the ship what?" Kirk : "Whath hathening in my mouth?" McCoy : "You got numb tongue?" McCoy : "I can fix that!" Romulan Guy : "Lord Nero! Seven Federation ships are on their way." Uhura : "What's going on?!" McCoy : "Jim! Come back! Jim, come back here!" Kirk : "Captain! Captain Pike sir, we have to stop the ship!" Pike : "Kirk! How the hell did you get on board the Enterprise?" McCoy : "Captain this man is under the influence of a severe reaction to a vaccine, he's completely delusional and I take full responsibility." Vulcan : "Vulcan is not experiencing a natural disaster, it's being attacked by Romulans!" Pike : "Romulans? Cadet Kirk, I think you've had enough attention for one day, McCoy take him back to medical, we'll have words later." Kirk : "Sir, that same anomaly-"
Spock : "Mr Kirk is not clear to be aboard this vessel Captain. Under Starfleet regulations that makes him a stowaway. I can remove the Cadet from the bridge." Kirk : "Look , I get it you're a great arguer, love to do it again with you sometime... try it! This cadet is trying to save the bridge!" Spock : "By recommending a full stop mid-warp during a rescue mission?" Kirk : "It's not a rescue mission, listen to me it's an attack." Spock : "Based on what facts?" Kirk : "That same anomaly, a lightning storm in space that we saw today also occurred on the day of my birth, before a Romulan ship attacked the USS Kelvin. You know that sir, I read your dissertation. That ship which had formidable and advanced weaponry was never seen or heard from again. The Kelvin attacked a place on the edge of Klingon space, and at twenty three hundred hours last night there was an attack. Forty seven Klingon warbirds destroyed by Romulans sir, and it was reported that the Romulans were in one ship, one massive ship." Pike : "And you know of this Klingon attack how?" Uhura : "Sir, I intercepted and translated the message myself. Kirk's report is accurate." Kirk : "We're warping into a trap sir, the Romulan is waiting for us, I promise you that." Spock : "The cadet's logic is sound. And Lieutenant Uhura is unmatched in xenolinguistics, we would be wise to accept her conclusion." Pike : "Scan Vulcan space, check for any transmissions in Romulan." Communications officer : "Sir, I'm not sure I can distinguish the Romulan language from Vulcan." Pike : "What about you, you speak Romulan Cadet...?" Uhura : "Uhura. All three dialects, sir." Pike : "Uhura, relieve the Lieutenant." Pike : "Hannity, hail the USS Truman." Hannity : "All the other ships are out of warp and have arrived at Vulcan sir, but we seem to have lost all contact." Uhura : "Sir, I pick up no Romulan transmission, or transmission of any kind in the area." Kirk : "It's because they're being attacked." Pike : "Shields up, red alert." Sulu : "Arrival at Vulcan in five seconds... four! Three! Two!" The ship emerges from warp into a massive debris field. The key information here is two lines. One from Chekov's briefing : "At twenty two hundred hours, telemetry detected an anomaly in the neutral zone." Note, not 22:00 a few days ago, just 22:00. Well, maybe he just skipped the few days ago part, right? But then from Kirk : "...and at twenty three hundred hours last night there was an attack." Last night. There is simply no getting away from the fact that the attack on the Klingons happened on the previous night, not several days ago. So then we have to believe that the trip to Vulcan took one day, at the very most, rather than four. The reimagined Enterprise is at least four times faster than the refit movie version of the ship. However, it's actually faster even than this. Look at the earlier events in the movie. Kirk is seen in a daylight scene with McCoy, discussing taking the Kobyashi Maru test again. He says he is taking it "tomorrow morning." Cut to Kirk in bed with Gaila when Uhura arrives, though Gaila had told Kirk she was "gone for the night". Uhura says she was in the long range sensor lab and describes the transmission she picked up about the attack. Gaila comments that she had thought Uhura would be in the lab "all night, I thought," indicating that this scene is set late in the evening. Kirk says that it is a "Big day tomorrow" and Uhura tells him "You're gonna fail", indicating that this is the night before the Kobyashi Maru test. Uhura then throws Kirk out. Kirk takes the Kobyashi Maru test and passes, via cheating. Kirk attends a hearing regarding his actions. The hearing is interrupted, and the Cadets informed of the crisis on Vulcan. We see Cadets being assigned to their ships; McCoy injects Kirk and takes him to the Enterprise. So the sequence of events is that Kirk took the test in the morning, was caught cheating, evidence of his cheating was uncovered, charges laid, the student body and a hearing panel assembled, the hearing held, Kirk went to the ship, the ship went to warp, Kirk got injected and fell asleep. All this, and only then can we try to insert a block of time whilst Kirk sleeps until the arrival at Vulcan, that same day. How long for all that? Presumably the test would have taken place in the early morning... 9 am or so. It's hard to believe they held the hearing before noon or so, given that they had to assemble a large audience to do it. Assigning crew and flying up to the ships, perhaps an hour or so. The Enterprise couldn't really be expected to depart before early afternoon, then, so the trip to Vulcan couldn't take more than six hours or so. This would make the reimagined Enterprise some sixteen times faster than the movie refit version. And this is being generous. In reality, it would probably take hours to assemble the evidence and lay formal charges against Kirk then assemble the hearing. Given the other circumstantial evidence, everything points to a trip that took probably an hour or less. The reimagined Enterprise, going flat out, is at least sixteen times the speed of the baseline speed of the movie refit version of the ship. And more likely several times faster even than this. Given a 16 light year distance from Earth to Vulcan, a 6 hour trip would equate to a speed of around 23,300 times the speed of light. If the trip took 1 hour, the speed would equate to about 140,000 times the speed of light. Of course, this isn't necessarily to suggest that the top speeds of the reimagined Enterprise is actually 16 times higher than the top speed of the movie refit version. If you remember, earlier on I suggested that the four day voyage to Vulcan did not necessarily represent a maximum speed run so much as a chance to "run in" the engines nice and gently. Possibly, then, that running in process was to take the form of a few days at a nice low warp factor, and once run in they also could have done the trip in a few hours. Of course it's also worth bearing in mind that the reimagined Enterprise was a brand new ship when it departed for Vulcan, and that was the first time it ever flew at warp - and her engines didn't need any kind of running in process. Perhaps that indicates that the movie refit version wouldn't either... or perhaps not. We can do no more than speculate on that point. But whatever we choose to believe in terms of the comparison, we do have a good canonical idea of the speed of the reimagined Enterprise.